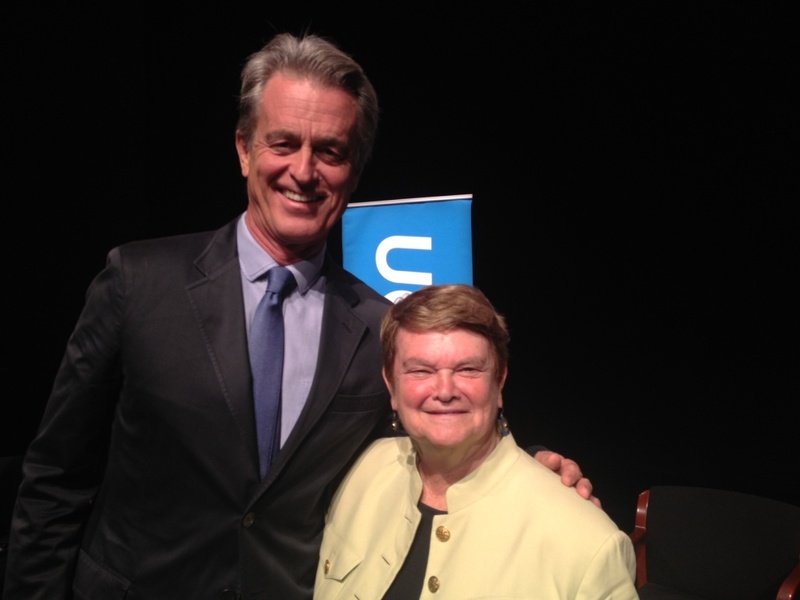 In a debate marked by polite jabs - and few large disagreements - former State Senator Sheila Kuehl and former Santa Monica Mayor Bobby Shriver faced off Tuesday night in Westwood to woo voters for a seat on Los Angeles County’s powerful Board of Supervisors. Kuehl said she dealt “with the very issues that the county must face” during her 14 years in the state legislature in Sacramento - from health care to juvenile justice to housing policies. She said she'd authored 171 bills signed by three governors: two Republicans and one Democrat. “This is not an entry level position,” she said, noting the enormity of the county - and it's problems. The line was a clear jab at Shriver's political experience as a former Santa Monica councilman and mayor. The nephew of President John F. Kennedy, Shriver said he'd convinced Republicans in Congress to provide more funding to alleviate AIDS in Africa. “The scoring of political points and trying to posture - as is frequently done in Sacramento - doesn't make sense” in county politics, he said. Those were about the biggest fireworks during the debate, the first since the primary. Kuehl, 73, and Shriver, 60, both said they agree with an increase in the minimum wage. Both also support asking voters for an extension of the half-cent sales tax to pay for county transportation projects. Their main policy disagreements centered on the route of the purple line (Kuehl wants to move it) and business tax breaks (Shriver favors them). The democrats are vying replace Zev Yaroslavasky on the five-member board, which oversees a $26 billion budget. Yaroslavsky is termed out of office. The winner will represent the sprawling third district, which includes Santa Monica, Beverly Hills and most of the San Fernando Valley. Yaroslavsky has not endorsed anyone in the race, and both candidates made sure to tell the audience of about 200 at UCLA’s Freud Playhouse Tuesday they "love" the supervisor's work. Kuehl finished above Shriver in the June primary, 36-29 percent, with 150,000 votes cast. Well over twice that number is expected to cast ballots in November and the race is expected to be close. Perhaps the moment that best illustrated how their candidacies would change the county came when Kuehl called Nevada a “fool” for offering Tesla Motors $1.3 billion in tax incentives to build a battery plant there instead of California. Shriver, who is endorsed by the Los Angeles Area Chamber of Commerce, disagreed. “It's one of the greatest investment misses that I’ve seen in a long time,” Shriver said. Kuehl, who is backed by most labor unions, asked why not create more government jobs instead of offering tax breaks to companies that re-locate. “People say ‘oh my god government jobs.’ But they’re good middle class jobs with benefits," she said. Kuehl also said she opposed a move by the current Board of Supervisors to require a four-fifths majority vote to increase wages for county workers. Shriver said he would be comfortable with such a requirement if it applied only between budget cycles. The debate was sponsored by the university, the L.A. Business Council and the Century City Chamber of Commerce. As for the new subway line, Kuehl said she would be open to changing the route of the Purple Line to avoid burrowing under Beverly Hills High School, in response to a lawsuit by the city of Beverly Hills. Shriver countered that he's opposed to any changes. He said they could jeopardize federal funding and suggested Kuehl is buckling to pressure.